A beautiful stainless steel and glass roll-on application. 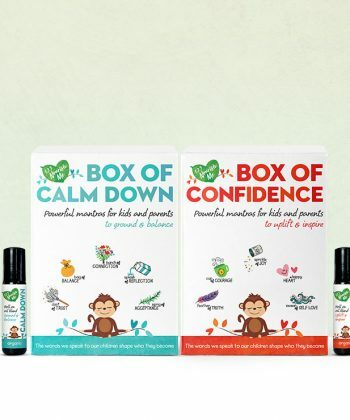 Confidence Essential Oil Roll on is a unique blend designed to uplift and inspire and support confidence in kids. Happy Kids Roll-On are a powerful pair and are designed to support kids emotional needs. Safety info – Pure Essential oils should not be used topically on children. Essential Oils Blends should only be used on children highly diluted under supervision of a qualified aromatherapist or medical practitioner. See INDIVIDUAL PRODUCTS for FULL Product Description. What’s in Confidence Roll-On Organic Essential Oil? Organic ingredients of: Safflower Oil (Carthamus Tinctorius Seed Oil), Organic Sweet Orange Oil (Citrus Aurantium Dulcis Peel Oil), Organic Lemon Oil (Citrus Limon Peel Oil), Organic Jojoba Oil (Simmondsia Chinensis Seed Oil), Organic Camellia Oil (Camellia Oleifera Seed Oil), Organic Almond Oil (Prunus Amygdalus Dulcis Oil), Grapefruit Oil (Citrus Paradisi Peel Oil), Mandarin Oil (Citrus Nobilis Peel Oil), Organic Bergamot Oil Non-Phototoxic (Citrus Aurantium Bergamia Peel Oil), Tangerine Oil (Citrus Reticulata Peel Oil), Organic Vanilla CO2 Extract (Vanilla Planifolia Fruit Extract) and Rosemary Extract (Rosmarinus Officinalis Leaf Extract) Love and Hugs. What’s in Calm Down Roll-On Organic Essential Oil ? Organic ingredients of: Safflower Oil (Carthamus Tinctorius Seed Oil), Mandarin Oil (Citrus Nobilis Peel Oil), Organic Jojoba Oil (Simmondsia Chinensis Seed Oil), Organic Camellia Oil (Camellia Oleifera Seed Oil), Organic Almond Oil (Prunus Amygdalus Dulcis Oil), Organic Australian Sandalwood Oil (Santalum Spicata Wood Oil), Organic Sweet Orange (Citrus Aurantium Dulcis Peel Oil), Organic Cardamom Oil (Elettaria Cardamomum Seed Oil), Organic Palmarosa Oil (Cymbopogon Martini Oil), Organic Ylang Ylang (Cananga Odorata Flower Oil), May Chang Oil (Litsea Cubeba Fruit Oil), Organic Geranium Oil (Pelargonium Graveolens Leaf Oil), Amyris Oil (Amyris Balsamifera Bark Oil), Jasmine Absolute (Jasminum Officinale Flower Extract), Buddawood Oil (Eremophila Mitchellii Wood Oil), Rosemary Extract (Rosmarinus Officinalis Leaf Extract) Love and Hugs.